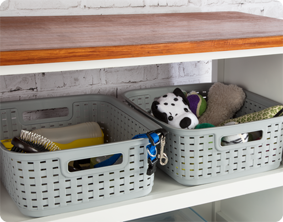 Ideal for storing and organizing pet toys and supplies in visible spaces. A great solution for organizing books and magazines. Short Weave Basket is rated 5.0 out of 5 by 7. Rated 5 out of 5 by misskathy from great fit I love this bin. It is great to toss things in that I need to bring to other rooms in my house. Love it! Rated 5 out of 5 by Jamimichele3 from Multipurpose decorative basket that is durable These baskets are light but made from a thick plastic that is very durable. They can be loaded with kitchen dry goods and easily taken out from a cabinet without buckling or twisting. I also like that the edges are not widely fluted as you can easily place multiple baskets on a shelf without loosing precious storage space. 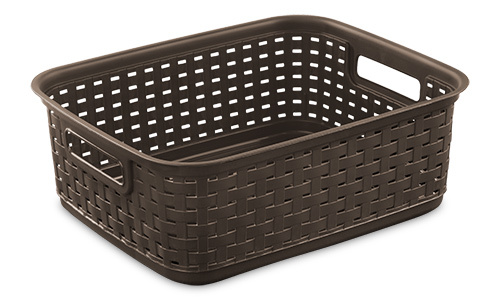 The decorative finish makes these baskets more asthetically pleasing than a solid plastic finish. They won't be an eyesore if you leave them around your house to collect odds and ends. Another highlight is that they are easy to clean and wipe out. 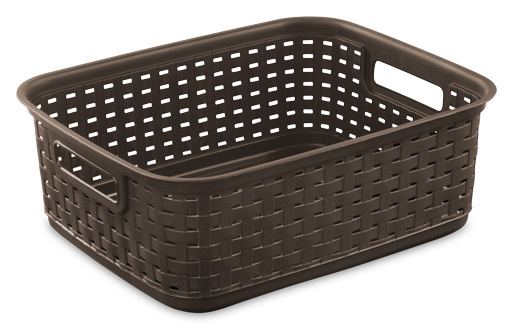 I use these baskets in many different areas of my house. The kitchen for storing small bags of flour, coconut flakes, chocolate chips, spices, and bags of pasta. Nothing will accidentally fall out of the cabinets because they're odd shaped packages stacked on top of each other. I have one in a drawer with all of our toddler cups and lids. I use them in the bathroom to keep small bottles contained. They are also used in my child's room to organize socks, pajamas and other clothing items in drawers. My cats like the size of these baskets. I have one filled with cat toys. The height is great because the cat can easily retrieve toys from it and it can double as a cat bed. 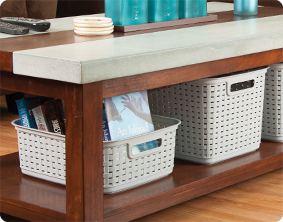 Your imagination is the limit on where to use these baskets! Rated 5 out of 5 by CraftyGma from Flexible yet durable This product is both flexible and durable. The weave pattern is a nice touch. It should stand up to years of use in my preschool classroom. Rated 5 out of 5 by Sunshine7304 from Versatile and Stylish I received free samples of both the short and the tall weave baskets and I love them. The short one is the perfect size for catching all the junk papers on my desk. It is deep enough to hold a lot until I can clean it out and put everything away, and it looks nice on the desk. I use the tall basket on the steps to hold things and then transport them up and down the stairs. It holds enough to limit the trips, but not so much that it gets too heavy. Rated 5 out of 5 by Mrs. S from Great product I just purchased a few of these to help organizer my bathroom closet. They are durable and look nice.